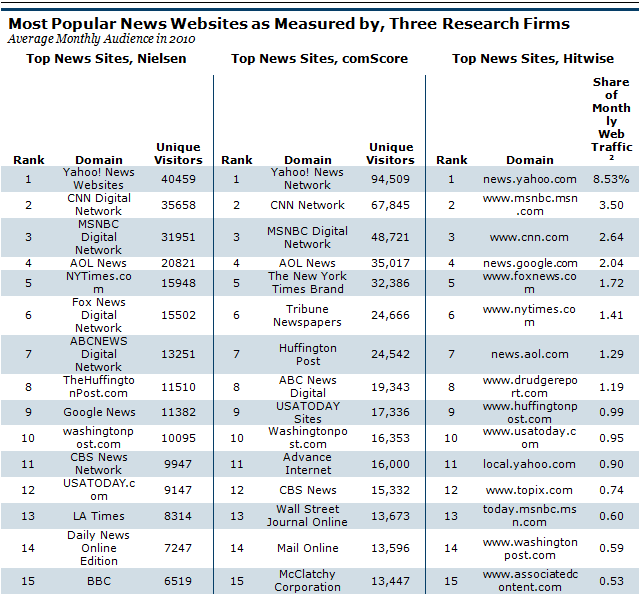 Which news providers make it in among the top 25 for total U.S. traffic? While the raw figures for visitors vary from one metrics firm to the next (Nielsen’s unique visitors numbers are often much smaller than those of the ratings agency comScore, for example, and both rely mainly on home-based traffic rather than work-based, which may undercount total news consumption) the list and rank of top sites remains relatively consistent across measuring companies. Eleven are newspaper websites: The New York Times (nyt.com), Washington Post (washingtonpost.com), USA Today (usatoday.com), Wall Street Journal (wsj.com), LA Times (latimes.com), New York Daily News (nydailynews.com), New York Post (nypost.com), Boston Globe (Boston.com), San Francisco Chronicle (sfgate.co), The Chicago Tribune (ChicagoTribune.com) and the British Daily Mail (mail.co.uk). Six are broadcast network television or cable news sites: MSNBC (msnbc.com), CNN (cnn.com), ABC News (abcnews.go.com), Fox News (foxnews.com), CBS News (cbsnews.com) and BBC News (bbc.co.uk). One is a wire service news site: Reuters (reuters.com). Three are hybrid online-only sites, which do a mix of aggregation and original reporting: Yahoo News (news.yahoo.com), AOL News (news.aol.com) and Huffington Post (huffingtonpost.com). Four are pure news aggregators: Google News (news.google.com), The Examiner (examiner.com), Topix (topix.com) and Bing News (news.bing.com). The list from another main Web traffic firm, Hitwise, is nearly identical – it contains nearly the same mix of properties. The same is true, though it sometimes groups families of sites differently, of comScore’s list. See the full list of most trafficked news sites. As a group, the top 25 general interest news sites differ markedly from the way people interact with one of the biggest specialized news sites on the Web, ESPN.com. In total numbers, the audience of ESPN.com, the sports news Website, comes in just behind that of YahooNews.com and MSNBC.com and ahead of all the Websites of legacy news organizations. In audience behavior, however, the site is strikingly different. Fully 20% of ESPN.com’s audience returns more than 10 times per month. And more than a quarter of visitors (26%) spend more than an hour on the site over the course of the month. That is nearly three times higher than the average percentage of power visitors at the top 25 general interest news sites (7%). General interest news sites are actually closer in behavior to the shopping site Amazon.com. Amazon consistently ranks among the top five Web destinations overall—49.5 million unique visitors per month according to Nielsen. The site, which sells everything from diapers to digital books to furniture, is designed for quick transactions but also wants shoppers to return often. Its audience, compared to the top news sites, tends to return a little more often but stay a shorter period of time. Only 7.5% of its users visit more than 10 times per month, nearly equal that of the average across the top 25 news sites (7%). By contrast, nearly two-thirds of its audience (65.4%) visits just once or twice a month, versus 77% on average for the top news sites. In total minutes, about a quarter (24.4%) clock one to five minutes per month while 15% spend more than an hour, double the average for top news sites. These numbers suggest that the ESPN digital network, whether driven by the topic matter, technical design, content quality or a combination, has found a formula for attracting and retaining an audience that most general news sites have not. General news by its nature may not elicit the same kind of passion as a single topic might, particularly sports, which are built around drama and have finality each day with game results. But there may well still be insights to glean from ESPN.com’s success. For one, it suggests that specialized sections or “verticals” on specific topics could build loyalty if well enough executed. For another, it suggests that certain topics may be so deeply covered by specialists that general news sites would be best to devote their resources elsewhere. Share of Monthly Web Traffic (from table): See PEJ’s annual State of the News Media report for an in-depth look at all three measurement companies methodologies.